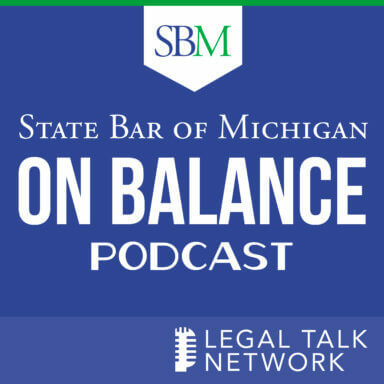 The State Bar of Michigan podcast series, On Balance, features a diversified array of legal thought leaders. Hosted by JoAnn Hathaway of the bar’s Practice Management Resource Center and Tish Vincent of its Lawyers and Judges Assistance Program, the series focuses on the need for interplay between practice management and lawyer-wellness for a thriving law practice. Allison Shields talks about how lawyers can do more in less time. Victoria Vuletich talks about what the law school experience is like for the current generation of students. Judge Michelle Rick and attorney Kim Jones talk about Michigan’s rule changes for limited scope representation that aim to lessen the justice gap. Judge Joseph J. Farah shares how attorneys can prepare a proper motion. Carolyn Williams, Joseph Golden, and Susan & Ed Haroutunian talk about what they valued most in their careers as lawyers. Leonard Suchyta, Bruce Neckers, Susan Howard, and L. Brooks Patterson talk about what they valued most in their careers. Justice Bridget McCormack’s talks about how lawyers can balance their careers and personal lives in a healthy way. Chris Anderson talks about the four sessions he presented at the NEXT Conference that all centered around law firm owner freedom. Susan E. Reed breaks down some of the complexities of immigration law, encourages lawyers to be educated on immigration law, and offers ways lawyers can partner with clients at MIRC. Nicole Black talks about artificial intelligence and other legal technology. Michigan attorneys Tom Rombach and Odey Meroueh discuss limited scope and access to justice initiatives in their state. Judge Wendy Baxter and Graham Ward talk about the benefits of alternative dispute resolution (ADR) and how this form of practice is still evolving. Hon. Christopher Yates, Hon. Jon Hulsing, and Hon. Tim Hicks talks about the right way to present summary disposition motions. Kara Hart-Negrich talks about being the incoming chair to the Young Lawyers Section, upcoming plans and events for the next year. State Bar of Michigan NEXT Conference 2018: What Initiatives Matter Most to Bar Leaders? Jennifer Grieco and Donald Rockwell talk about the programs and initiatives that have meant the most to them as bar leaders. Jack Newton talks about 2018 Legal Trends Report and what it reflects about the legal industry. Larry Port talks about what a lean law firm is, addresses common misconceptions and what makes this system successful. John Reed talks about essential marketing strategies for lawyers and how it's different from the business development. Shawn Healy talks about depression in the legal profession and why it’s so common. He also offers tips on ways to address depression before it reaches a crisis point. Andrew Elowitt explains the type of qualities that will make someone a successful law firm manager. Patrick Krill talks about dealing with anxiety and substance abuse within the legal profession. He includes relevant studies and resources for both lawyers and employers that help cultivate wellbeing in the workplace. 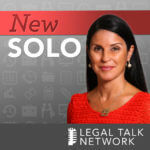 Lea Ann Sterling discusses her experience establishing a successful law firm before practice management tools became popular, the importance of getting advice from reliable experts about technology and bookkeeping and how to find such help. Brian Cuban talks about what you can do about addiction both as a lawyer and as an employer. Casey Flaherty talks about why investing in proper training is an essential part of investing in new technology. Mary Roush and David Leasure discuss the statewide e-filing initiative that the state is working on with ImageSoft in order to bring e-filing to the Michigan Courts. Samantha Meinke talks about how and why lawyers should use social media to improve their practice. Justice McCormack discusses the benefits to judges using social media including communicating with other judges across the state and effectively sharing information with the public. Justice Kurtis Wilder shares what it’s like to argue cases in the Supreme Court and the different skillsets involved. Takura Nyamfukudza, Mary Chartier, and Dennis and Kim Tomasik about the details of their wrongful imprisonment case. JoAnn Hathaway and Tish Vincent talk to Kris and Marty Tieber, the attorneys who helped reconstruct the Tomasik case and free Dennis Tomasik. Samantha Meinke talks about the 2017 Next Conference including what’s new and what opportunities are available for attendees. ABC’s Dan Abrams discusses the tension between lawyers and the media, finding unbiased jurors, and how this tension affected the Casey Anthony case. Janet Welch helps Tish Vincent and JoAnn Hathaway introduce “On Balance,” which premieres this week on Legal Talk Network and delivers useful and entertaining ideas on managing life as a lawyer.